Many people who attend a Reiki course learn the basics of self-treatment with Reiki, but few discover its real potential for self-healing. Penelope Quest explains how Reiki can be used as a powerful tool for healing mind, body, emotions and spirit to create wholeness and harmony, personal peace and a sense of purpose. This book is designed to provide you with easy access to the real impact and power of self-healing with Reiki, and it is packed with innovative yet simple-to-follow techniques. 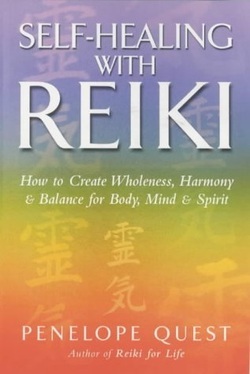 Published by Piatkus in the UK, and by Tarcher/Penguin in the USA, it is aimed at EVERYONE who has worked with Reiki at any level. In Summer 2013 we had some more very good news—that the US edition of SELF HEALING WITH REIKI had won the 2013 Nautilus Silver Award. The Nautilus Book Awards recognise 'books and audio books that promote spiritual growth, conscious living and positive social change, while at the same time stimulating the imagination and offering the reader new possibilities for a better life and a better world.' Each nominated book is judged y experienced teams of book reviewers, librarians, authors, editors, book shop owners and leaders in the US publishing industry, so it is a very prestigious award, and I was naturally delighted to receive such recognition for my ork. However, I was especially pleased because this is the THIRD YEAR RUNNING that one of my books has won this award, which is absolutely amazing!